We crossed the Oklahoma Panhandle on a recent trip to Black Mesa for a hike up to Oklahoma's highest point (but that's another story). 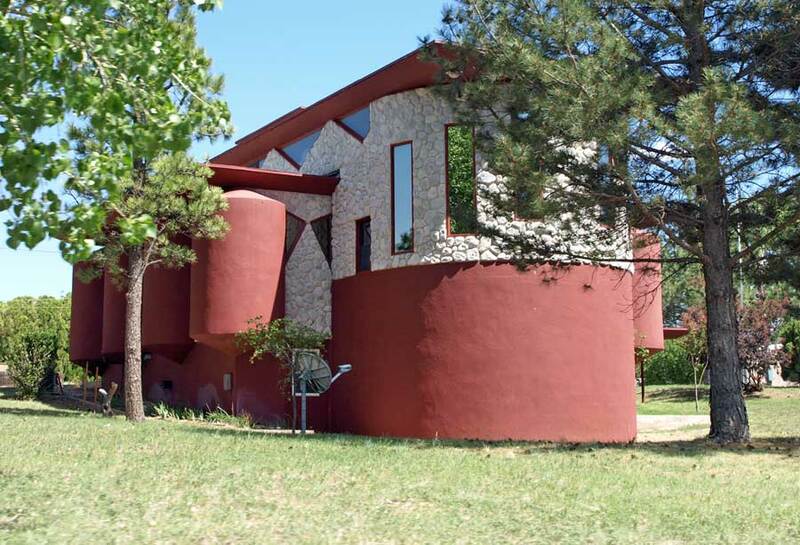 I had read about the two private residences in Beaver, Oklahoma designed by Bruce Goff, so we decided to make a detour. We discovered a great little town and a number of interesting buildings! At one time the panhandle had aspirations of statehood. A short-lived movement hoped to turn No Man's Land into Cimarron Territory. 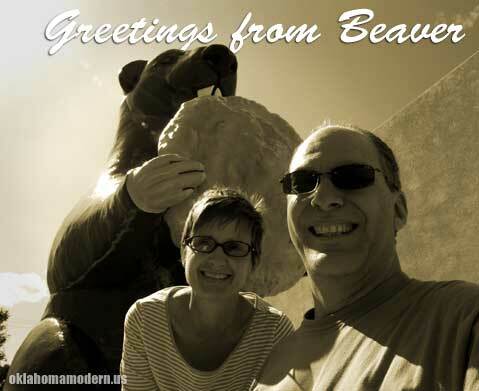 They declared Beaver City their capital and petitioned Congress to officially recognize it. Fortunately the vote failed and preserved our state's unique shape- pan with a handle. By 1890 the entire panhandle of Oklahoma was known as Beaver County, and I suppose it only made sense that the county seat must be Beaver City? After statehood the "strip" was divided into three counties, Beaver City became simply "Beaver" and the wind kept blowing. Today the town is home to about 1,500 and is world renowned for its annual flinging of bovine excrement. 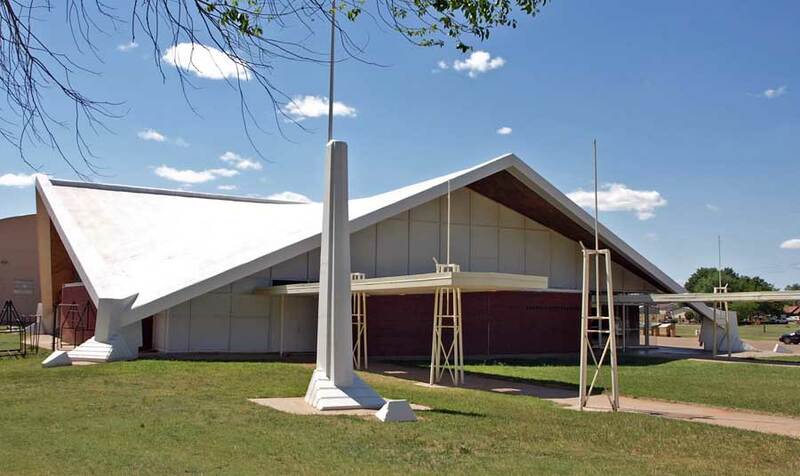 The Beaver County Free Fair is hosted in this awesomely angular building designed by Tommy Jay Shaw and built in 1960. The roof extends almost to the ground. Towers out front have a distinctive similarity to oil derricks. It looks like some windows have been covered over the years- not unusual for buildings of this period. The seemingly free energy of the Sixties met with reality during the energy crisis of the Seventies. Many Mid-Century Modern buildings suffer from single-pane windows and inefficient heating and cooling systems. But the building's overall condition appears to be quite good. Just around the corner is the community swimming pool. The entryway of this building was rather unique. But the real gems in Beaver are found off the main drag. Driving through the residential areas we found quiet neighborhoods lined with nice ranch-style homes. 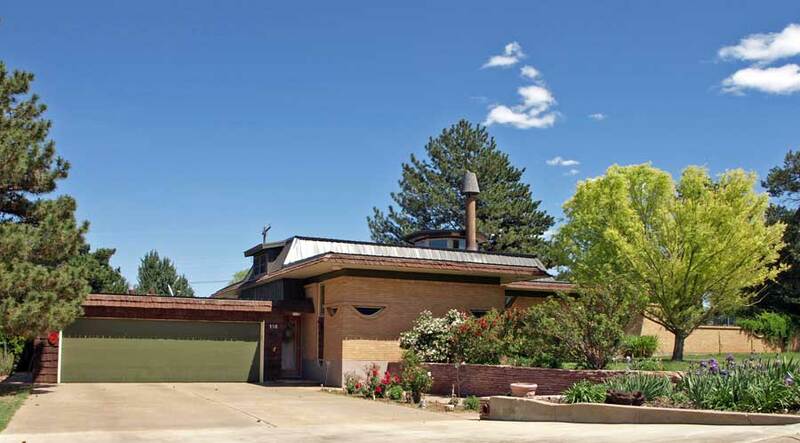 Two residences here were designed by our favorite eccentric architect, Bruce Goff. The first one we found was a home built for Celestine Barby in 1962. The house features a low, long brick wall that hides an interior balcony. 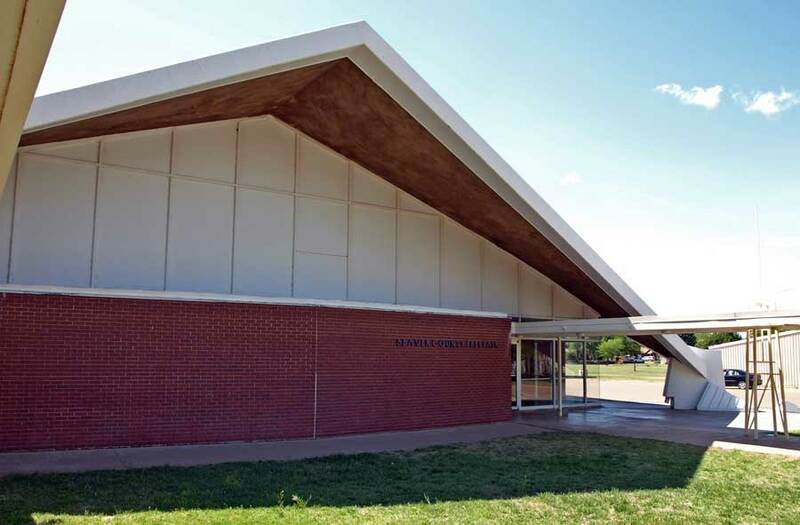 The exterior appears to have been modified over the last 50 years, but the general appearance is pretty original. This spaceship was built for William Dace in 1964. A carport extends from the front of the home, and that's about the only conventional feature. 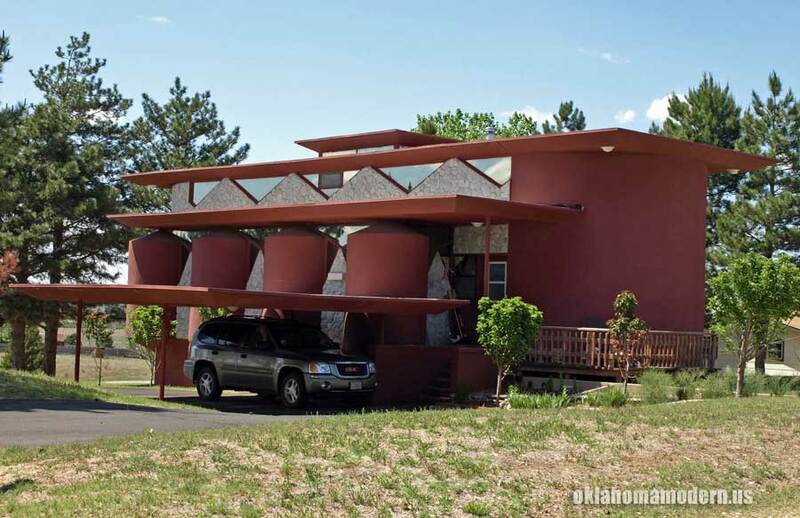 The house is a series of two-story tall cylinders. Viewed from the rear the similarities to the "storage pods" of the Bavinger House are quite noticeable. While some modifications to the exterior are evident, the house appears generally sound and very well maintained. Our visit was all too short- and we had to rush on without visiting any of these remarkable structures. But we left wanting more! Beaver, Oklahoma offered us a refreshing surprise in the middle of No Man's Land. Goff in the Desert is a video tour of Goff's work, including several no longer standing. Great design. The house is really done by an expert as evidenced by the design. Thanks for sharing this one. Ya think? Just one of the greatest architects of the 20th century. 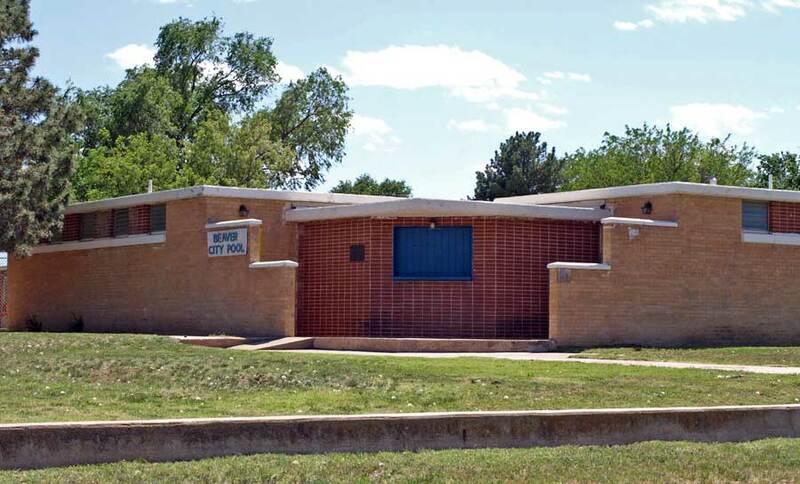 I love reading about people appreciating the Goff houses in Beaver Oklahoma! It is a very small town and my grandfather was one of the primary carpenters in the area so naturally he worked on many of the surrounding projects. I have a copy of blueprints for the Dacy house which I could see from my grandparent's home. The Barby house was right across the street from my grandparent's. Naturally, I was intrigued. Grandpa told me to go knock on the door and ask to see the house. It was like stepping into a different World!